Despite the odds, former poison taster Yelena and warrior Valek have forged an irrevocable bond - and a family - that transcends borders. Now, when their two homelands stand on the bring of war, they must fight with magic and cunning to thwart an Ixia plot to invade Sitia. Yelena seeks to break the hold of an insidious evil that could force her to make a dangerous deal whilst Valek peels back the layers of another dark betrayal. At its rotten core lies a powerful sorcerer . . . and his latest discovery - that the fate of all rests upon two unlikely weapons. One may turn the tide. The other could spell the end of everything . . . I fell in love with Yelena and Valek in Poison Study and have been a devoted fan of this series ever since then. 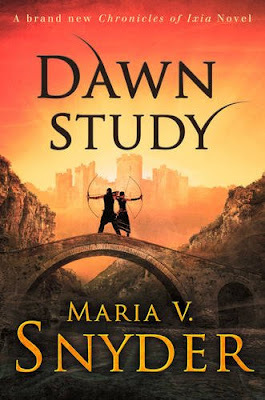 Maria V. Snyder has created such a wonderful world along with so many favourite characters and I just devour each new instalment so I'm pretty heartbroken that Dawn Study is the final book. If you're going to end a series then it has to be on a high note though and she has definitely achieved that goal here. This book was action packed from beginning to end, we get a chance to catch up with all our favourite characters (old and new) and I don't think there could have been a more fitting end to the series. This is the conclusion we've been building up to, the final showdown between Yelena and her herd and their longstanding enemies, and it was well worth the wait. Owen Moon thinks he has everything planned down to the tiniest detail, he has the Commander brainwashed, the Master Magicians and the Sitian Council are under his control and he is about to start a war between Ixia and Sitia to destroy the magicians once and for all. Unfortunately for him Yelena, Valek and their allies are determined to stop him at any cost. They're short on manpower, they're up against weapons they have no idea how to counter and they are still trying to figure out all of Owen's backup plans but they're fighting for their lives and they're aiming to win no matter what it costs them. I'm not going to say anymore about the plot but just when you think you have everything figured out Maria V Snyder throws another curveball to change the game completely. Our team are hit with one thing after another and the danger has never been greater so it's genuinely an edge of the seat read that leaves you praying everyone you love will make it to the end. If I have one complaint it's that I'd have liked a longer epilogue but that's only because I'm not ready to say goodbye to these characters and I wanted to spend more time with everyone, not because the book actually needed any more. I can't help it, I'm greedy when it comes to this world! In reality I actually think the author was right to end Yelena and Valek's story here, it's about time they found some peace and are able to focus on themselves and their growing family. That doesn't mean I'm not hoping for more in the future though, I'd be happy to read extra stories about ANY of the characters in this world but what I'm really keeping my fingers crossed for is a spin off set a few years down the line starring some of the younger characters. I'd love to see more of Reema and Teegan as they grow into their powers and just imagine how much they could achieve if you had them working alongside Fisk and his helping hands or Valek's younger siblings. Onora would be another interesting character to follow and I'd be happy to spend more time with Ari and Janco too. There are so many options for expanding this world and of course if we could get a glimpse into Yelena and Valek's future too that would just make things even sweeter. This is without a doubt one of my favourite series and it's one I can't recommend highly enough. It has been excellent from beginning to end and Maria V Snyder continues to be an auto-buy author for me so no matter what she decides to write next I'll definitely be reading it.